The following scans and delightful texts were provided by Brenda Parsons. 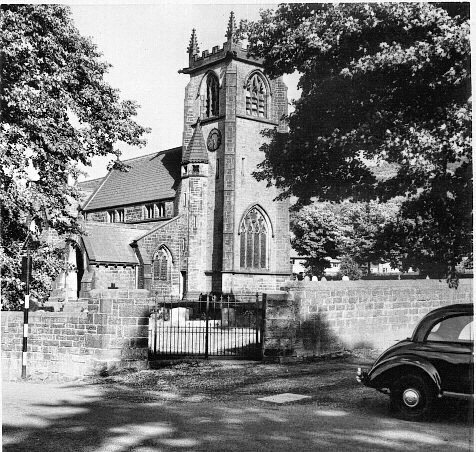 Brenda wrote "They were taken on a bright sunny day in the summer of 1960 with a Kodak Brownie I think - not a lot of room for anything fancy on one of those either, just a case of point, click and hope they came out OK!!". 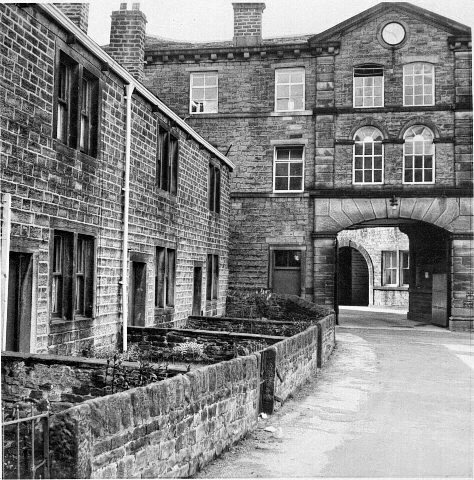 The house was adjacent to the mill wall which occasionally proved to be handy for my mum apparently. The gates of the mill used to be closed once the mill day had started, I don't know what time that would be, 6.00am, 6.30am, something like that but if you weren't inside ready to work by then it was too bad and you stayed locked out until lunch time when they were opened again. You would also lose that part of the day's pay. Our proximity to the mill wall led to mum climbing over it if she was running late. Or so she told me, whether she did and how often I've no way of knowing. I do remember the 'knocker-up' though. He used to come around with a long pole and knock on people's bedroom windows to wake them up and get them to work in time. It always seemed to be very dark and very cold and I suppose I was looked after by someone while mum went to work, no idea who though although I think it was someone in the same street. I used to love the little gardens of the houses on Mill Hill, they were always full of bright flowers in summer and opposite the houses was the cricket pitch, another of my favourite haunts. Playing roly-poly down the hill trying to avoid the nettles and the cow pats, and more disgustingly, prodding the cow pats with sticks to break them up and make the flies swarm out. The roller was another source of delight - the heavy roller bit was in the middle and the handles came out from the middle of the roller, one on one side of it and the other on the opposite side so we had a ready made see-saw. A couple of us on one side and the same on the other and you could see-saw until you felt sick. Saturday afternoons were good when there was a cricket match on, we would hang around the pavilion when they had the tea interval hoping to be given any left-overs, a sandwich, a bun, a biscuit or a cup of milk, it didn't matter what it was we would see it off. Whether you got anything largely depended on how much the teams ate and also whether the ladies doing the tea felt like letting you have something, nothing was guaranteed so you won a few but lost a lot more! Over the hedge beyond the cricket field there was a large house, I still don't know whose it was, did it belong to the then mill owner? When I wasn't see-sawing or cadging food I would sit and make daisy chains and think up scary stories about this house, the size of it fascinated me and I imagined lots of ghosts must live there since it was so big. 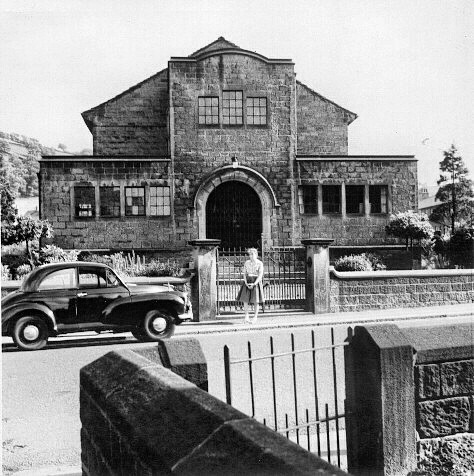 I'd love to know more about it if you know anything of its owners and history. 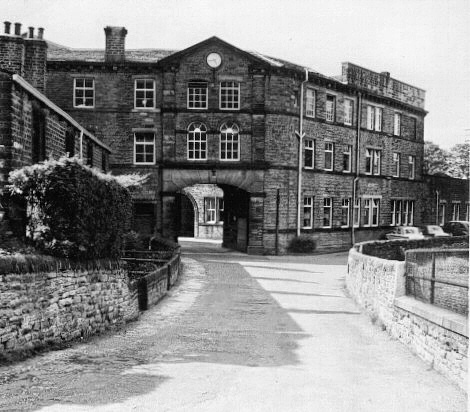 The road going beside the mill used to lead to a little bridge over the beck and that was often my route back home to Holme Bridge - across the bridge, turn left and walk through the fields alongside the beck until I reached the houses by the wall, a right turn and I was home. Again my name for this mill, the 'top mill', which was up by the Black Bull, so presumably Hartleys? 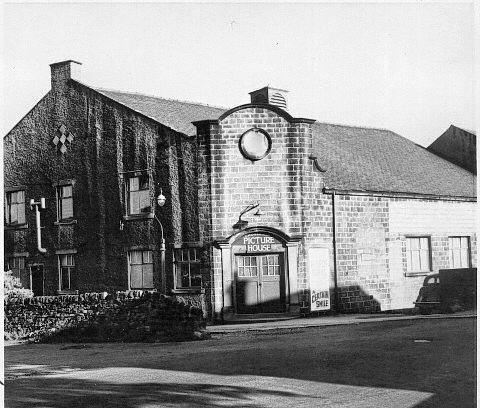 This mill was along the road from Cross Hills to Glusburn. 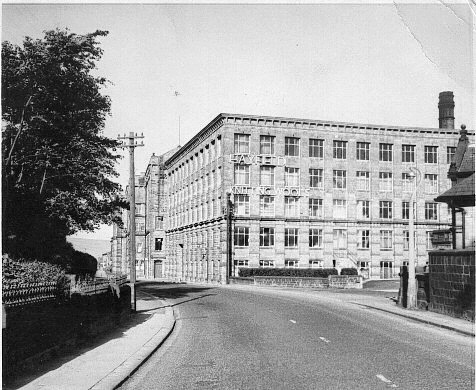 Closer investigation of the photo shows that in 1960 it had Hayfield Knitting Wools on the wall, was it always Hayfield's or did someone else own it prior to that? 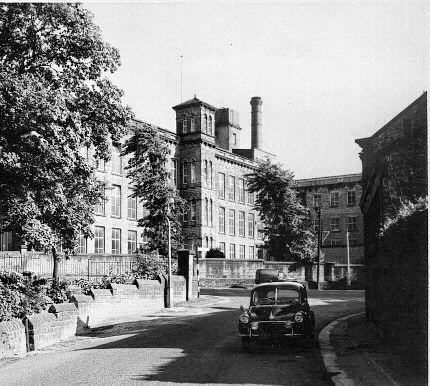 I have the name Horsfall's in my memory but where was that mill, if indeed there was a mill of that name? 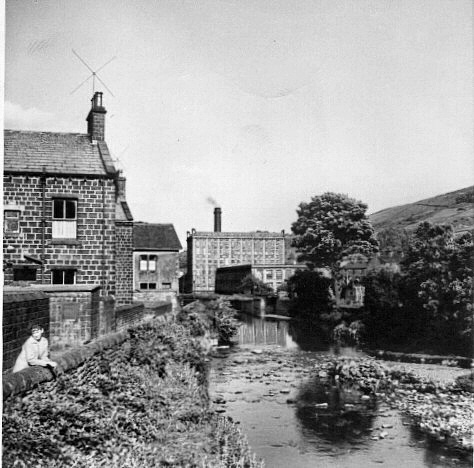 A view of the beck and Bairstow's mill from Holme Bridge. The figure squinting against the sun is yours truly, leaning against the wall I climbed over many, many times to get down into the beck. No sophisticated equipment, just a jam jar and lots of patience, waiting for those little tiddlers to swim into my cupped hands and then be swiftly transferred into their new home in the jam jar. My favourite spot to play and handy for home, I just had to walk between the houses behind me and there I was in our back yard. This was where I would go home to after my adventures in the beck. 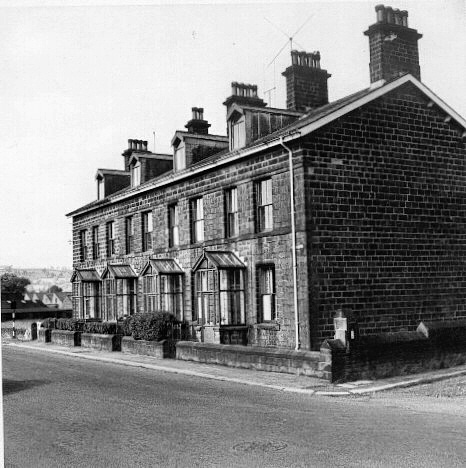 We moved to here from Harker Street and the last time I visited Sutton the houses were still there. The block had a name I'm sure, someting like Holmefield but I can't remember, and it stands on Holme Lane I think it's called, between Thompson's woodyard and the bridge. Starting on the right by the drainpipe the first house was the home of Albert and Kathleen Hargreaves, and their children Laurie, Bruce and Auriole - my spelling of that last name might be totally wrong so apologies to anyone from the family. I only ever heard the name and never saw it written down. Laurie and Bruce were my playmates, their sister was a bit too young to play with us. 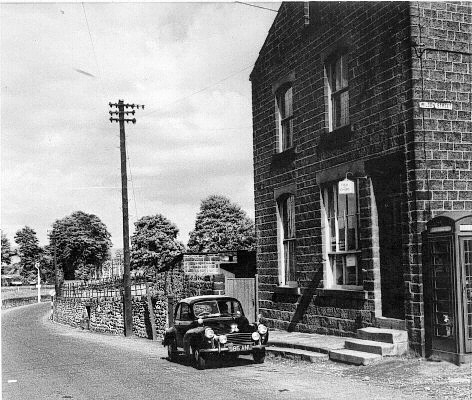 Next to them was where I lived and in the third house along was Mr and Mrs Heaton, I think Mr Heaton's name was Spencer. The last house of the block I think was occupied by the Thompson's who were farmers and I seem to remember there was a wall between the Heaton's house and the Thompson's so you weren't able to get into their yard. There was no wall between any of the first three houses so we had plenty of yard space to play in. 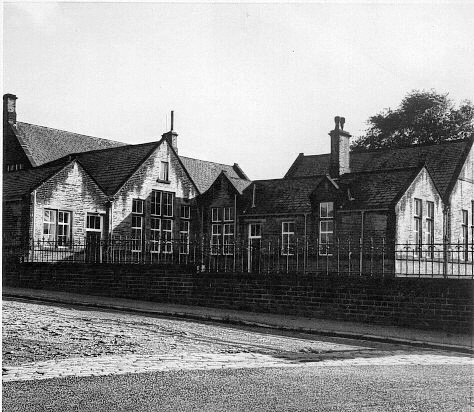 Mum told me I started nursery here when I was three. My earliest memory of being here is of playing with lots of toys and then having to take a nap in the afternoon which didn't please me at all. Out would come the folding wooden camp beds with the green canvas which was uncomfortable to be on, and then you got covered with a grey army blanket with red stitching around the edges. The blanket made you itch as it was coarse woollen, the canvas base was rough and hard and there you were sandwiched between them and expected to nod off for the next hour. I'm not sure I ever did go to sleep but I do remember that the red stitching round the edge of the blanket had me fascinated. 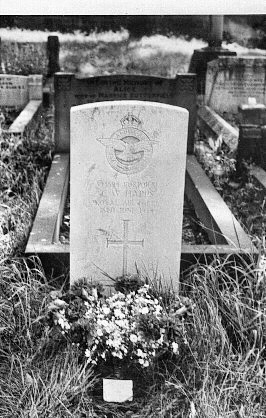 I've included this picture of my dad's grave as it's a military one and as such might be of interest to someone. Dad was a corporal in the RAF and was killed at RAF Kidbrooke, London in July 1944 when a V1 fell on the base. His name was Clarence William Happs and he was the son of Charles Edward Whiteoak and Agnes Mary Happs. He was born before his parents got married, I think there was some family reluctance somewhere to allow them to get married but I don't know the ins and outs of it. Whatever it was it didn't work as they got married anyway a couple of years after dad was born. However he kept his mother's maiden name hence the name difference. Sad to say but I have no recollection of him. I understand that my brother in law to be was billeted here prior to being posted to India. They apparently did their training in the surrounding countryside. Another building with a family connection as my future sister in law lived here when she worked in the mill. I've sent her the picture of the girls and staff from the gallery in the hope that she can identify some of the people on it. I'll let you know what she can remember. Just further along the road from the hostel and opposite the top of Harker Street was this chip shop which I do remember frequenting. Further along the road was a well in the wall with clear spring water running from it. I remember being sent there to fetch water in what my mother called a 'lading can'. This was a white enamel jug with blue rims top and bottom. Why I was sent escapes me as I know we had taps and running water so maybe it was just to give me something to do or get me out of her hair for a few minutes. Although in my case it would be more than a few minutes as I would end up playing in the water for long enough rather than just filling the jug and going home. Another family link here as this was where my brother started work as a delivery boy when he left school. Remember the bike Granville had in 'Open All Hours'? 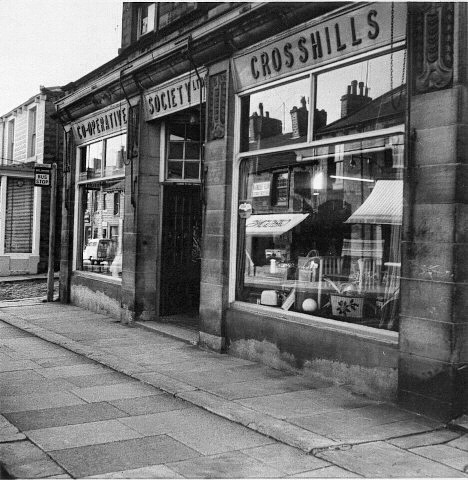 That was what my brother rode to make the Co-op deliveries - one of the original Granville's! Hope he wasn't as accident prone! Yet another family association as my sister used to work in the pay box which I think entitled her to concessionary tickets at Charlie's so we went pretty often. They had first and second house showings in those days, not like the continuous programming that came much later on. 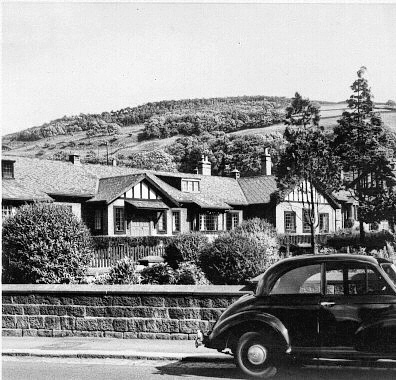 It didn't seem to matter which 'house' you went to there was always a queue down the hill by the side of the building. The programme changed twice a week, I think it was Wednesdays and Saturdays, and at the end of each showing they played the National Anthem and everyone stood up and waited for it to finish before leaving the cinema. Well apart from my mum that is, she had a habit of leaving just as the film was coming to an end so she didn't have to stand for the anthem and thus could get out and into the queue for the chip shop before everyone else did! I must have missed the end of countless films this way. I see from the poster that 'A Certain Smile' was playing the week the photo was taken. I looked it up and found that it starred Rossano Brazzi, one time Italian heart throb, and Joan Fontaine. Can't remember if I ever saw that film but I do remember Johnny Mathis having a big hit with the title song. On the other side of the road there used to be a sweet shop where we would buy something to take into Charlie's with us, if we had the ration coupons that is, if not you went without. I used to look longingly at the boxes of chocolates on the shelves behing the counter even after being told there was nothing in them and that they were only for display. I seem to remember the people who ran the shop had a daughter called Ruth and that she had long ginger hair tied in two plaits. Would be nice if someone could put me right on that as I might be linking the girl with the shop quite wrongly.